Never let your favorite .22 LR pistol, rifle, or revolver go hungry again with this 500-round brick from Winchester. Each of these rounds propels a 40-grain solid LRN (lead round nose) bullet at a supersonic speed out of rifles and a subsonic speed out of pistols. The LRN's dome-shaped head promotes reliable feeding in any action and makes a great choice for plugging paper targets or attacking reactive plates at a Steel Challenge match. In addition, Winchester lubricates the bullet for smooth function and corrosion resistance. 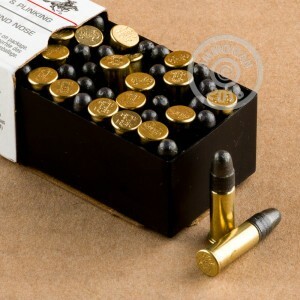 Each projectile is crimped into a rimfire brass casing with a non-caustic primer mixture at its base. 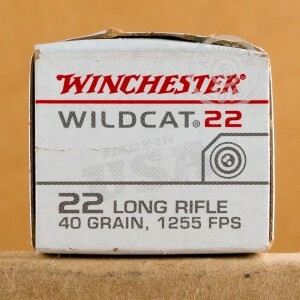 Winchester is an American company that has been around since 1866 and is responsible for developing calibers and firearm types that have traveled around the globe. This level of experience lends high quality and reliability to their loads that you can count on for any occasion.